Gather all your family and head to the country for a little R&R. The full-length porch in the front and double french doors off the living area warmly welcome you! Just inside is the spacious great room with 15' ceilings, pine floors, wood stove, and rocking chairs. The open concept kitchen is fully stocked with gas range, farmhouse sink, soapstone counter tops, and is surrounded by windows. The eating area is just off to the side with even more windows to enjoy the views. Wouldn't it be fun to watch these visitors while eating breakfast? The master suite has 15' ceilings, sitting area, electric fireplace with a European concept master bath complete with walk-in shower and double vanities. There is a ladder leading to a fort and bedrooms for the kids. The large back deck is just off the living area with artful railings and amazing views. The private lake is so serene. The home, views and lake would make for many wonderful memories but there is much to do and explore close by; skiing, ice skating, hiking, canoeing, kayaking, horseback riding, antique and gift shops, and more! 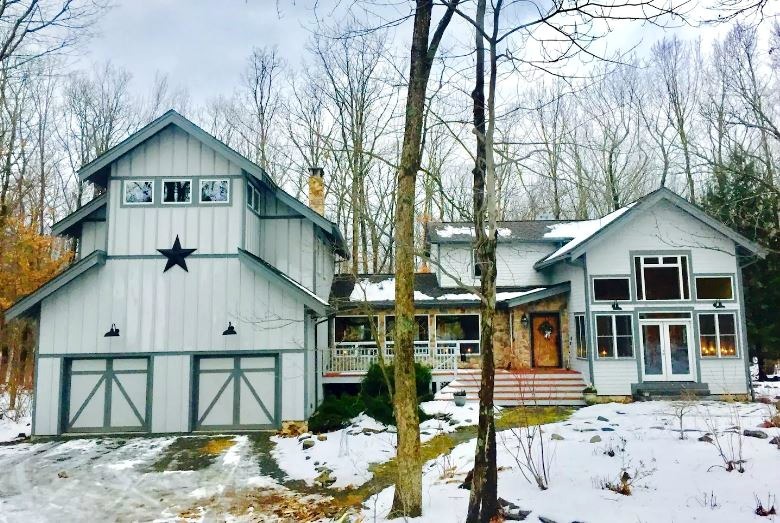 Located in Milford Pennsylvania, this country farmhouse has 4 bedrooms, 5 beds, accommodates 10, and can be yours for an average of $184 a night! What do you think...would you like to gather here for a family vacation? OH YES... what a beautiful spot. I am a native mid-western; born in Ohio, later moved to my mother's family roots of New England, in New Hampshire. This reminds me very much of New Hampshire winters and funny that I have lived in warm climates since 1982, I still VERY much miss the beauty of the snow / frosty days. Though I don't miss shoveling it nor ice storms! But then again, my town got hit twice in one month by tornadoes in January! So it is a trade off, LOL. But, yes, I would love to stay there for a few days! Maybe sometime, some winter.